Creating a successful glass sculpture installation project involves many aspects. However, the importance of listening should not be forgotten. We enjoy working one on one with residential customers and glass collectors. We appreciate knowing that someone wants to include our work in their lives. Sometimes customers contact us knowing exactly which pieces or groups of work they want. Many times, however, a customer’s needs may not be so clear. In other words, they are interested in our work, but are not sure what will work best for them. This is when ‘listening’ becomes important. Listening is the best path to getting to know someone. Katie Katz, from Bernard Katz Glass, spends a lot of time helping customers. One of the things Katie enjoys most is her conversations with customers. These conversations allow Katie to learn more about the customer. Sometimes these conversations aren’t directly about our glass work. These unrelated conversations may give clues for what a customer is really looking for. By listening, Katie is better able to understand their concerns, likes, or dislikes. 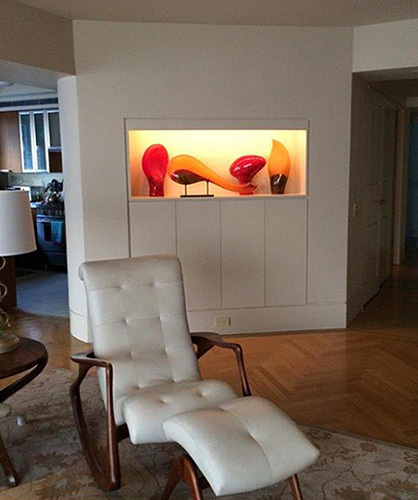 In this recent project, Katie learned the customer enjoys contemporary art and the work of sculptor, Henry Moore. Through their conversations, the customer expressed an interest in warm colors and having a ‘visual flow’ for the group of glass forms. We photographed multiple groupings of work for the customer to see. This made it easier for the customer to express more clearly which direction to go towards for the project. While working closely with the customer, the final collection of work for this glass sculpture installation came together wonderfully. It is important to take the time to make sure the customer will be happy with their purchase. Often, customers have expressed their appreciation for this attention to detail. I know that ‘listening’ seems like a no-brainer… But not everyone takes the time to do so.